What was up with the dirt this weekend? We haven’t seen Seattle like this since maybe 2008? How did this impact the racing? Seattle is one of the rounds that dirt is sourced each year, instead of storing it off-site for repeat use. The storage costs are apparently growing to unsustainable levels. Sourcing new dirt each year means it’s a crapshoot as to what the consistency will be. We have seen soft, almost sandy conditions (2009), black mush (2010), and harder dirt that didn’t break down much (2008 and 2019). The biggest variable in all of that is certainly the weather, though. Removing the almost perennial rain provided a rare chance for good racing in Seattle. 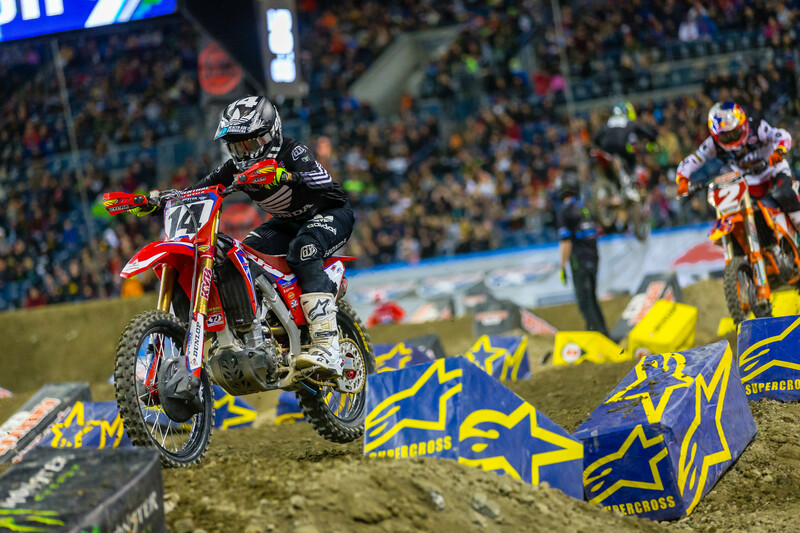 This was the closest to a typical supercross race that Seattle has seen in a very long time. The whoops were legit. Some were blitzing, some were jumping, some seemed non-committal either way. How does that decision get made by the riders entering the main event? The ideal approach to the whoops was constantly evolving throughout the day and night. During the day’s practice and qualifying, the ideal line was to blitz and commit fully. Riders like Chris Blose, Ken Roczen, and Jimmy Decotis all had these absolutely dialed in. They were making up time and looked comfortable. They were the aggressor, charging the whoops instead of the hesitant approach that many were settling for. On the other side of that coin, we saw several practice crashes by elite-level guys, all trying to push their own limit in this long, deteriorating section. As the night wore on, however, many switched to jumping. It was a test in technique and patience for many. Jumping whoops can’t be rushed. The key factor is maintaining the rhythm all the way through, remaining patient and one’s own urgency. Josh Grant was a victim of his own aggression. Instead of patiently jumping three at a time, he was overjumping, under jumping, and generally wreaking havoc on his chances. That eventually resulted in a spectacular crash, taking him out of the main event. I think Josh’s biggest difficulties were a result of inexperience jumping whoops like those. Blake Baggett looked to suffer the same fate in his heat race. Riders who tend to avoid jumping have a tougher time transitioning to it when needed. Marvin Musquin, who chooses to jump even when it’s not ideal, had been salivating all afternoon for his time to arrive. He has years and years of experience jumping sections like this, putting in a nearly perfect main event worth of tripling. There are many examples of Musquin suffering through the whoops but in a set like Seattle where jumping became the most consistent, effective line, he was the class of the field. The other factor in this blitz/jump dynamic was fitness. Blitzing is much more taxing on riders than jumping. Riders generally hold their breath while blitzing and it also requires maximum effort strength wise. Blitzing the longest whoops of the season 27 or 28 times takes a huge toll on any rider. In the early laps, Cole Seely was dominating the whoops. As the laps wore on, it was visually taking its toll on him and others. Jumping whoops, conversely, is fairly easy on breathing once the right rhythm is found. As I mentioned above, jumping whoops requires patience to execute effectively. That patience also allows riders to steady their heart rate and not redline in the way blitzing whoops will cause. The decision to blitz or jump always falls back to each rider’s comfort level. Musquin and Cooper Webb are usually leading the charge for jumping. They choose it as soon as it’s available and almost too early at times. Eli Tomac, Ken Roczen, Seely, Chad Reed, and others all blitz until it’s virtually impossible. Each approach has its strengths and weaknesses and can become ideal or detrimental all in the same race. In the rhythm lane before the whoops, riders were finding a way to quad. What was the key to getting this section right? Mostly, it was just committing to it. It wasn’t exceptionally difficult, but it was big. I would guess most of the 450 main event riders could have jumped it but that doesn’t mean everyone was willing to take that risk. If that section was at a practice track and riders were able to hit it repeatedly, jump off the side of the track, and size it up to their liking, nearly everyone would have done it. Race day is hectic and there are other sections to worry about, so many times this just gets put on the back burner if it’s not coming easily. It was definitely faster, though, so I must admit I was surprised to see some of the sport’s best opt out. With 17 rounds in the series, sometimes these guys choose to take the lesser option and live to fight another day. I think it’s pretty straight forward. This rule was created/altered in the wake of Ryan Dungey’s Detroit incident in 2016. Musquin clearly broke the rules and jumped. I do believe that he didn’t see the flag in the heat of the moment but that doesn’t excuse the violation. He broke the rule and didn’t argue the penalty, from what I have seen. The real problem here was a lack of knowledge and understanding of the rule as things were unfolding. Had the rule been communicated in real time, a lot of the drama could have been avoided. Webb dodged a bullet with the seven-point penalty, leaving Seattle with the exact same lead he came in with. Is there still reason to worry? I think there is. Musquin is on fire right now and was arguably riding a bit better than Webb for a few weeks before he began winning. Fourteen points is not a big gap with the talent at the front of the field. It’s true that the penalty was a brutal blow to Musquin’s chances, but the bigger factor will be Webb’s ability to slow Musquin down. With five rounds left, Musquin has plenty of time to make this a Las Vegas thriller. He doesn’t have any room for mistakes, though. His primary focus has to be finishing in front of Webb at all costs, regardless of the result. Musquin has momentum and speed on his side but one heroic effort from Webb could change all of that. If forced to choose, I think this title will tighten up over the next few rounds and lead to a dogfight in the desert. Yes, but they will need help. The only reason I have Musquin as much more relevant is his consistency and confidence. Tomac could win on any night but he just doesn’t have the week-in, week-out form to make up 19 points. Roczen is dealing with some health questions and looked much better in Seattle but unless he can win out, I just don’t see him climbing back into the title fight. It seems crazy to think they are both out when they aren’t far behind Musquin, but the momentum is trending toward a Musquin/Webb showdown. Tomac’s unexplainable rides during the season have taken him from the center of another title chase to scrambling for a way back in. What happened in the Reed/Brayton/Chisholm disaster? In a very rare mistake, Reed slid sideways when accelerating for a double. He veered left and came up short, causing ripple effects for many others. He tangled bars with Ryan Breece, sending both of them wildly off of the next jump. Reed ejected off the back of the bike, Breece was rear-ended by Justin Brayton, and all of them stacked into the next landing. Brayton landed with his body on the rear of Breece’s bike on impact, catapulting him spectacularly back into the air. Reed was a sitting duck for Kyle Chisholm’s front wheel, breaking his ribs and scapula on impact. Chisholm was treated to a front flip for his troubles, right back into the fracas of riders swerving the melee. It was chaos defined, a perfect example of one mistake evolving into catastrophe. Riders have zero room to maneuver when bunched up that tightly, and it only takes one to lose traction for a moment to take several down with them. Reed has made a career of avoiding this type of pile-up but this one turned badly. We likely lost two of our star riders for the season in one fell swoop. Cruel sport this supercross game is.